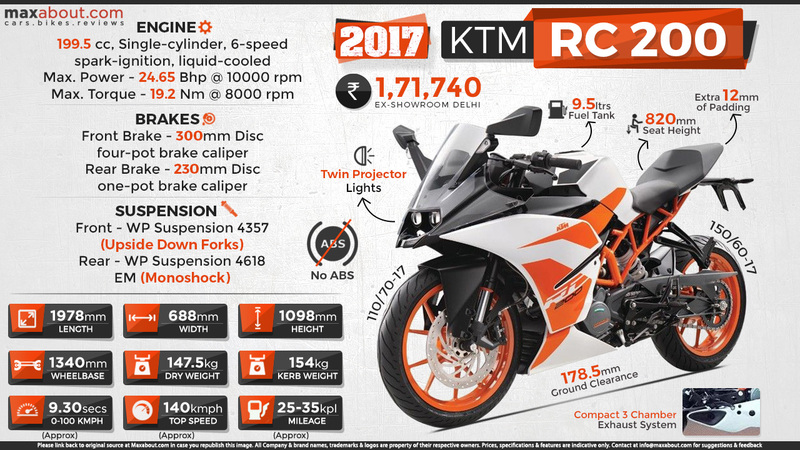 2017 KTM RC200 has been launched in India at INR 1,71,740 (Ex-showroom Delhi). The motorcycle undergoes cosmetic changes while mechanical features remain exactly the same as the 2016 version. The engine on the motorcycle is now BS4 compliant and produces the same output as the earlier model. The All-Black approach of the RC200 has now been switched to White and Orange on the 2017 version. Read More about 2017 KTM RC 200.